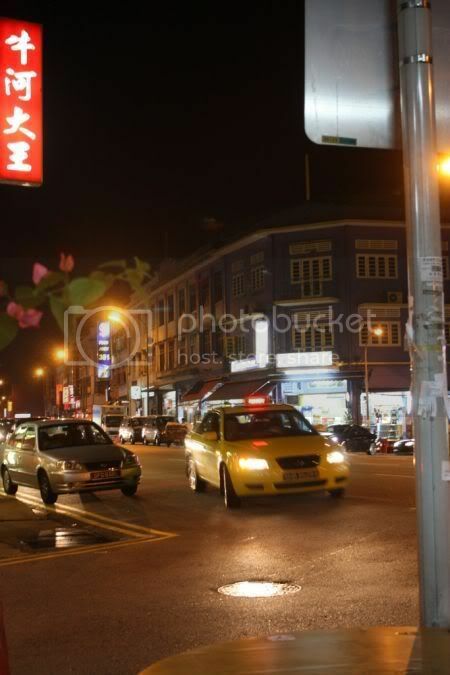 Good news - the KL Mayor announced the Jalan Alor name remains for that iconic street. Finally they have come to their senses. Maybe they can give pointers to the National Fatwa Council, which claims they will be announcing a ruling on yoga soon. Sounds very ominous...but let us wait and see, when the official annoucement is made. Recently, I stumbled on this great place right smack in the city - Menara Hap Seng. 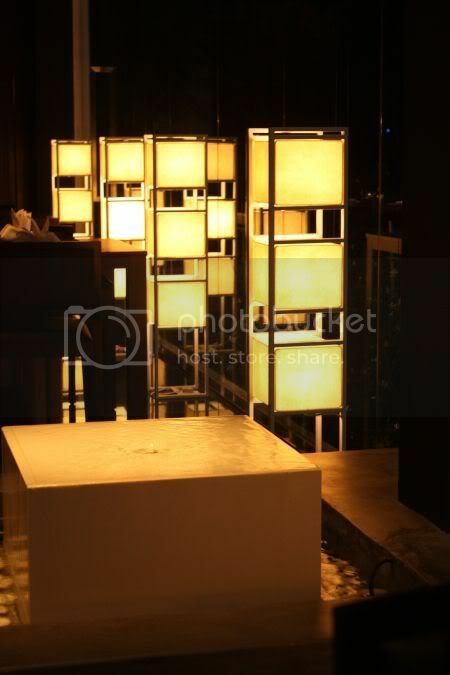 Refreshed from the old look MUI Plaza, it has an airy podium filled with restaurants and cafes. 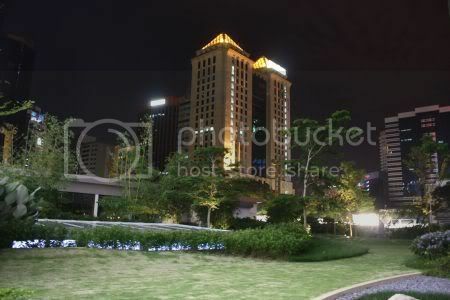 On top of the podium, there is a terrace garden with lovely trees and a great view of the buildings around it including KL Tower. On the lower levels, there is The Olive & Tree (a North Indian place), Sister's Kitchen (opened by the Sisters Popiah people and the most packed during lunchtime), Cafe 9 (a casual Malay place), San Terri, Oldtown White Coffee, Starbucks, Nagomi Shabu- Shabu, Desserts Bar and etc. On the top level, you have the restaurants - Elegant Inn (a branch from their Taman Connaught outlet), a yet to open wine bar and this place, we checked out - Xenri D'Garden Terrace. A branch of the ever-famous Xenri at Old Klang Road, this place was nice and quiet especially during the weekend. (note, Menara Hap Seng seems to cater for the crowd around the area, hence lunchtime is the most packed) Not having tried the original place, we were a little lost on what to order. We settled for old favourites and also tried out some of their specialties. Since we didn't eat any rice, ordered the recommended makis to share between the two of us. 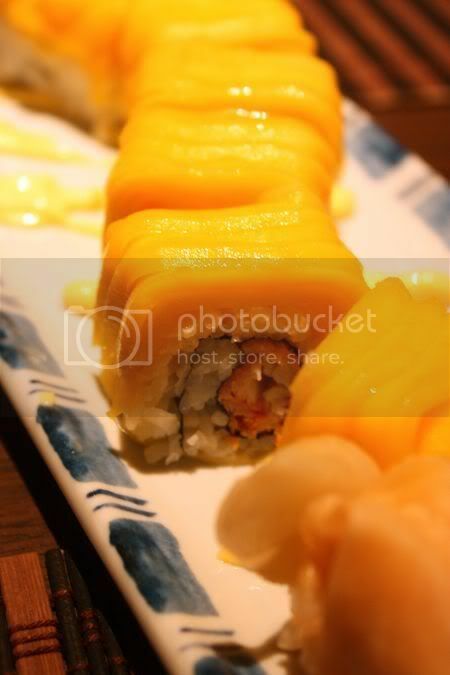 We both loved the Hawaiian Roll - laden with slices of sweet and ripe mango. Inside the maki, is a fried prawn. I thought it was a nice tropical touch to the Japanese item, which I vaguely remember reading before, they also do a similar thing in Brazil. 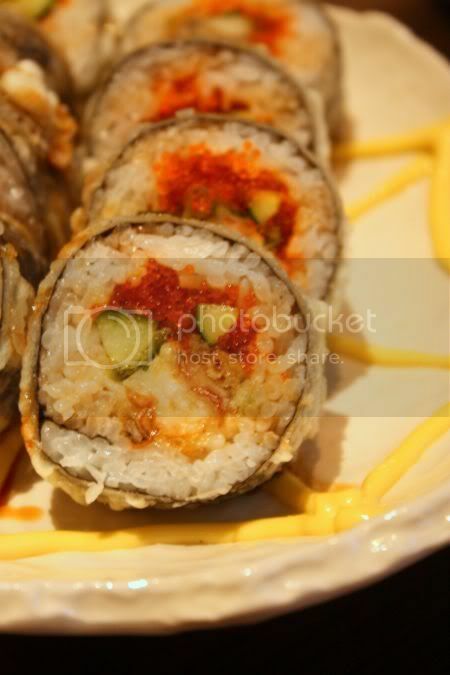 The other recommended maki, was the pretty ordinary tasting Spider Roll filled with soft shell crab. We thought the portions were nice and generous, but somewhat lacking in the taste department. I kinda suspect it is due to the ingredients, as the fried items could have been prepared ahead, hence they are not very crispy. Usually this roll tends to be quite dry, but this version wasn't and didn't disintegrate after one bite. 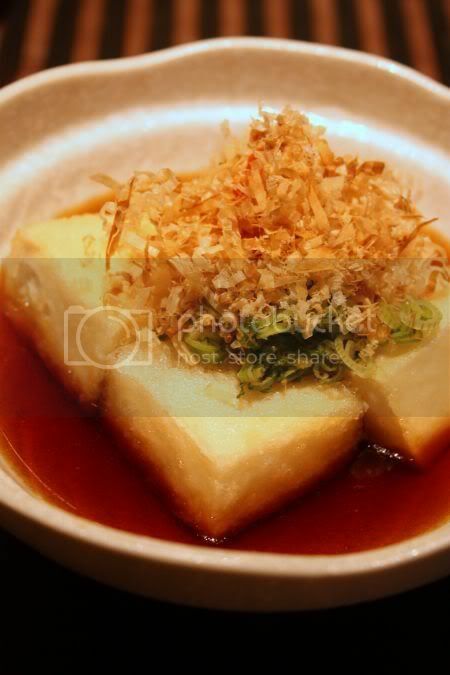 We usually either eat a salad or a beancurd dish, whenever we do Japanese. This time round, it was beancurd, which Splashie Boy requested for the fried version. 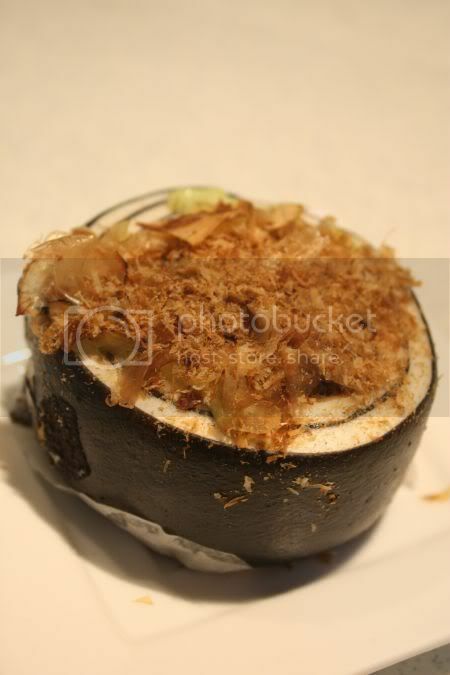 The beancurd was nice and smooth, with generous toppings of bonito shavings, spring onions and grated daikon radish. 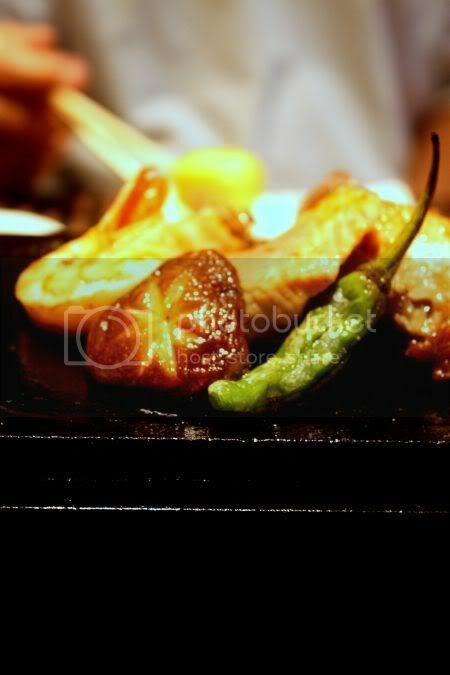 The menu here is divided into the usual dishes, set meals and the special dishes. I couldn't resist the baked oysters. 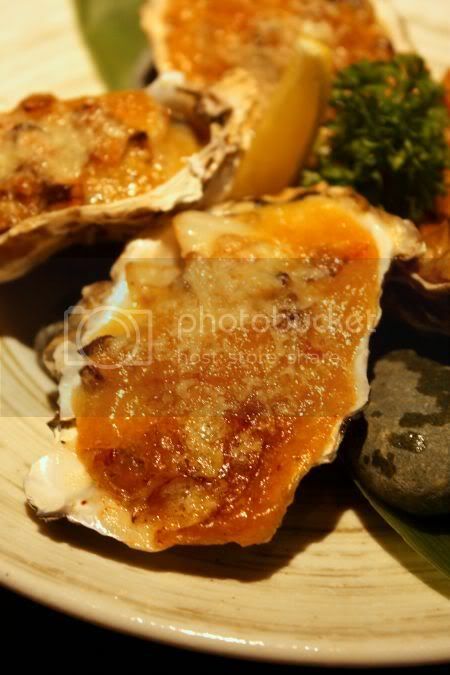 Consisting of a generous platter of 5 oysters, the oysters were topped with sliced shitake mushrooms and onions, a cheesy sauce and gratinated under the grill till brown. A little too creamy and rich for me, I thought the taste was quite average. Beef is always a must, with my other half. We asked the waitress for a recommendation - she mumbled something super expensive that I could see someone shoot me a "no way! I'll pay for that" look. Instead, we went for the mixed seafood and beef on hot stone, which was served with a prawn, two pieces of salmon, beef and a Japanese green pepper. 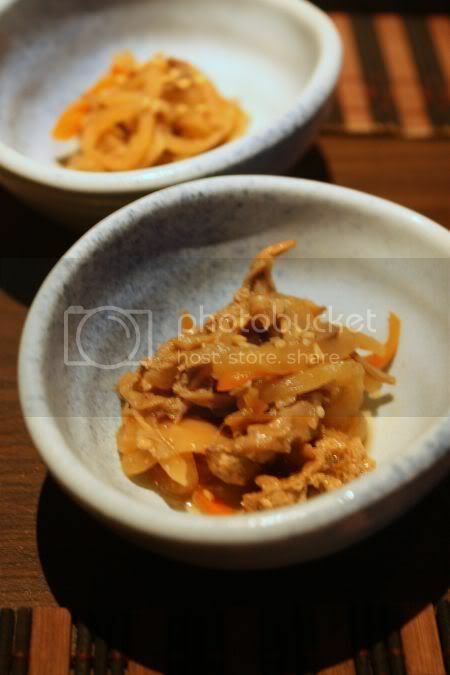 We were also served a sauce made from soy sauce and filled with daikon radish gratings on the side. Drizzle a bit on the food and the food tasted so delicious. Definitely the best item for the night. Overall, we thought the food was just average, nothing much to shout about. To be honest, I was more excited with the view and the whole area, rather than the taste of the food even though they scored high for me with their Hawaiian Roll and the mixed seafood and beef on hot stone. Seems the restaurant at Old Klang Road, does buffets during the weekends but this place serves ala carte all the time. Good place to drop by, when you feel claustrophobic from all the traffic on Jalan Sultan Ismail. For bigger pictures, see my flickr set. Happy Deepavali to all! Am sure you will either be celebrating with your friends or just enjoying the holidays. Sadly, I have to work today, sniff! 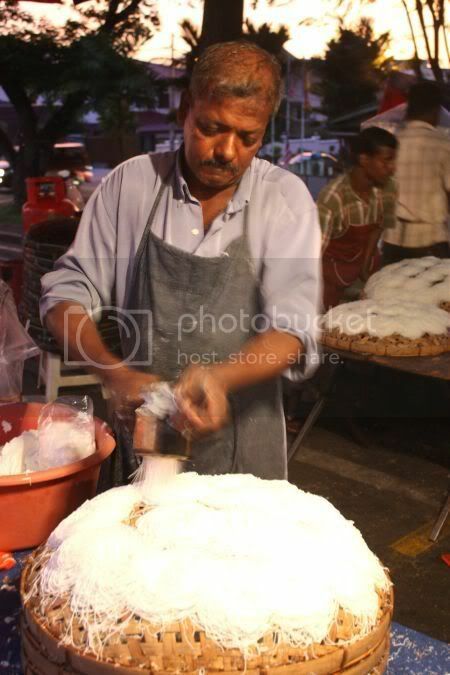 We stumbled on this discovery last night - putu mayam at SS3. This particular stall usually opens for the Tuesday night market (pasar malam) but last night, they opened to do business for the Deepavali celebrations, until 5am this morning. To celebrate the festival of lights, we bought a batch for dinner. Since they didn't have any curry, we just ate it with freshly grated coconut and brown sugar. 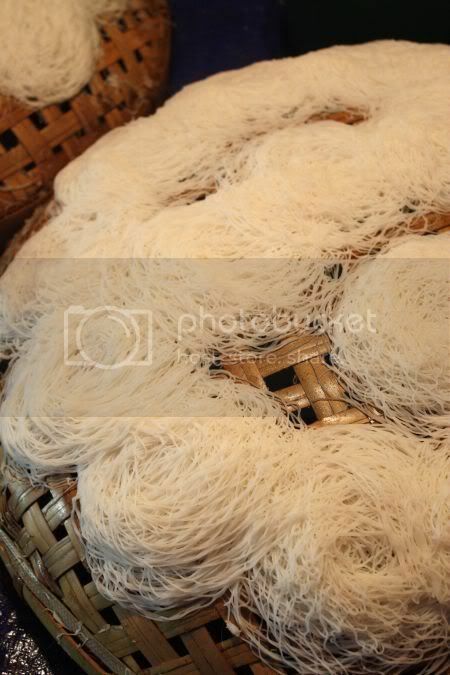 Really soft and delicious, as the people will make it on the spot (just press the rice flour mixture into the mould to create the vermicelli thin strands, steam it and serve). According to the stall owner, this is an essential food item for the celebrations. If you want to catch them, they will open on Tuesday night at the pasar malam again. I also took a few more pictures of the stall - them preparing the steamer and etc, so check out my flickr account. I vaguely remember eating here, once long long ago with my family, when I was younger. Somehow, in those days, Klang seemed so far away for me, but I just realised today, that this is so easy to get to especially with the highways. This place which can be kinda misleading - the faded signboard on top says Sin Hooi Hua but if you drive past, you see Fatty Mee Hoon Kuih written below the larger signboard. Even though, it was a weekday, the intermediate coffeeshop was quite packed. Luckily my order took about 15 minutes. You place your order at the stall, with the option to add a poached egg, additional meat, vegetables, fried ikan bilis and etc. 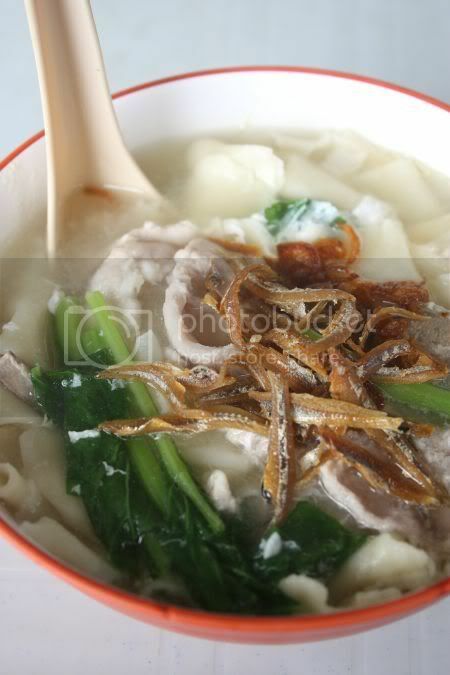 Unlike pan mee, this is the Hokkien version, where the dough is pinched into rough pieces and dropped straight in the soup broth to cook. What this results in, are irregular pieces of ultra smooth dough pieces that make this simply pleasurable. While the pan mee texture is harder, this type is way silkier and delish. Each bowl of mee hoon kuih is prepared on the spot, so you can observe the workers flattening pieces of the dough with the palm of their hands and pinching it with their fingers straight into the soup broth. Pork slices, liver, choy sum and fried ikan bilis top the noodles. I loved the fried ikan bilis, which I could see people ordering extra to add on top. Those who love the sourish chili sauce that goes with pan mee, will be slightly dissapointed as here they only serve these noodles with chopped bird eye's chillies. Here the soup is not overly sweet (a good indication of it being natural and not super enhanced), hence no worries about killing yourself with MSG. 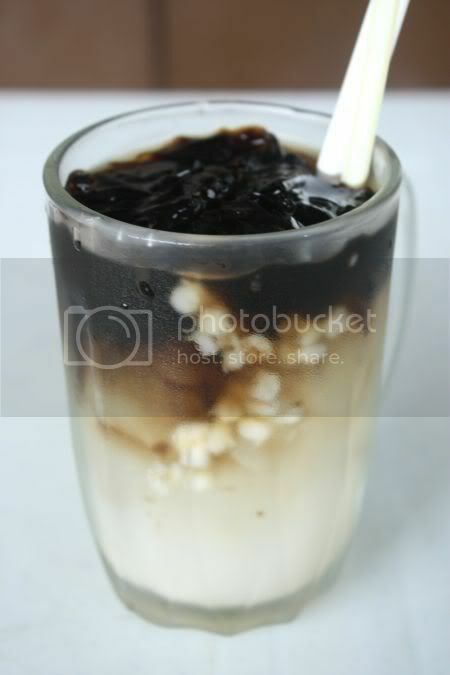 Aside from the noodles, this shop also serves an unusual drink - a combo of barley with sliced cincau. Very refreshing even though the cincau's taste tends to overpower the barley. For me, I will definitely revisit as I thoroughly enjoyed my bowl of silky smooth pinched dough pieces. Open from 10am-11pm daily. Only closed during Chinese festivals. "...Jalan Alor’s name was changed at the request of the National Economic Action Council following decisions made in its exco meeting. With regard to that, DBKL’s Road Naming Committee concluded in its meeting that the name of Jalan Alor be changed to Jalan Kejora to go with other roads in the vicinity named after the stars...."
Er, first of all, are the roads nearby named after the stars??? I don't think Tung Shin means star unless they think, Jalan Bukit Bintang which is literally translated to Star Hill is the link to stars? Moreover Kejora, which is the Malay name for the planet Venus (also known as Zuhrah), isn't a star!? Already there has been consternation among the hawkers who ply their trade on this infamous road. For decades, they have been referred to as THE place for food, especially for the tourists. Imagine, how difficult it will be for the tourists to look for a new place now even though they put Jalan Alor in brackets under Jalan Kejora. Moreover, Kejora ain't that easy to pronounce or spell either, especially for those who don't speak Malay. Just can't imagine us telling people, that it is Kejora Kai Yik (Kejora Chicken Wings) or Kejora Frog Legs Porridge they must try when they visit KL. What do all of you think about this renaming exercise???? Ever since I read about this place's existence from A Whiff of Lemongrass and recently, on Fried Chillies, I have been slowly exploring it. Sadly I seem to have a chunk of missing photos I took of a previous visit, just before Ramadan started hence the pictures only cover a recent visit. Popular in Shah Alam for its spread of Kelantan dishes, everything is laid out buffet style (or hidang style in Malay), so help yourself to what you wish to tuck in. 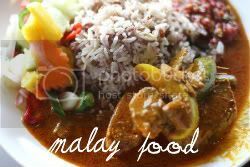 Breakfast is the best time to drop by, with all their famous dishes: nasi dagang, nasi kerabu, nasi impit and unusual sweets like pulut pagi and apong. 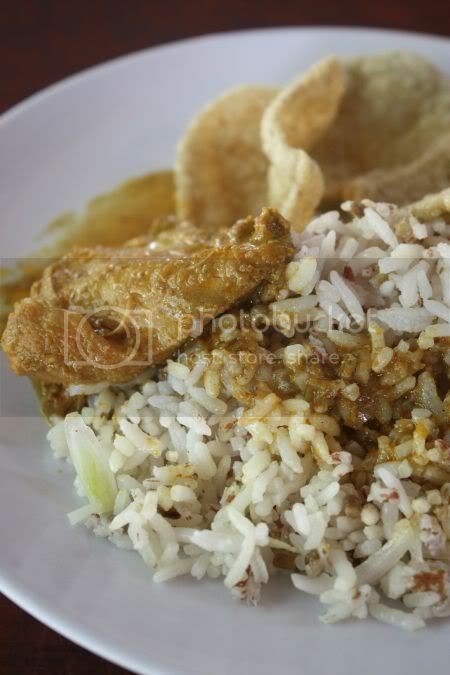 I'm not much of a fan for their version of nasi dagang as it has a softer texture, kinda akin to normal rice. For my palate, I kinda prefer the chewy type. 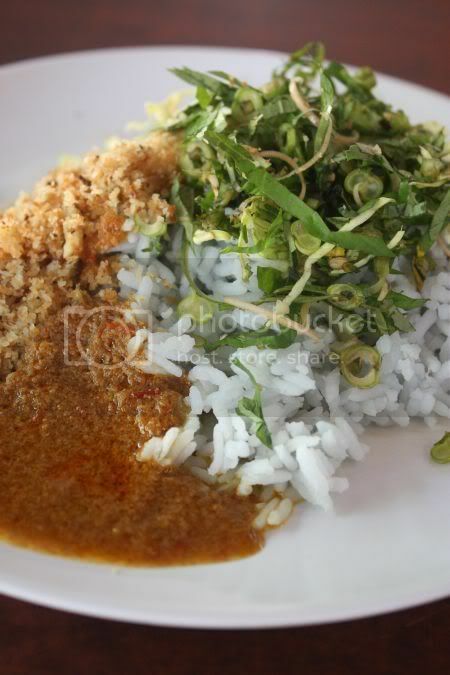 The nasi kerabu is not bad - I like the natural pale blue colour of my rice, which I can add as much ulam as I like with grinded fish flakes and a sweetish sambal like sauce. While the ulam, was not super fresh, the tasty fish flakes made up for the dish. I've also tried the laksam, which is pretty good with a satisfying coconut milk creamy sauce. 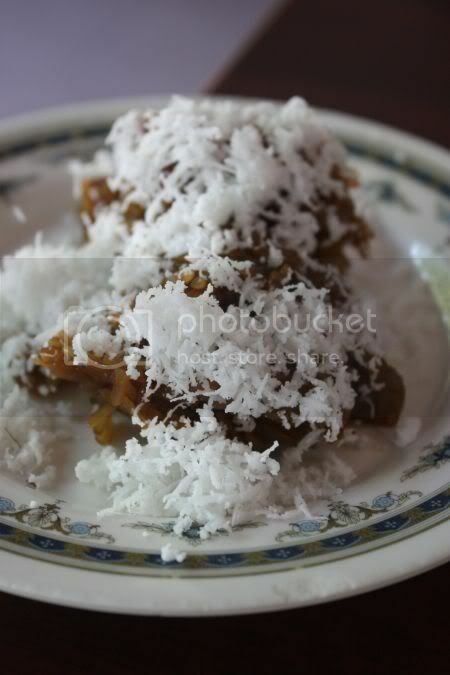 However, one of my absolute favourites here is the little seen dessert known as pulut pagi. 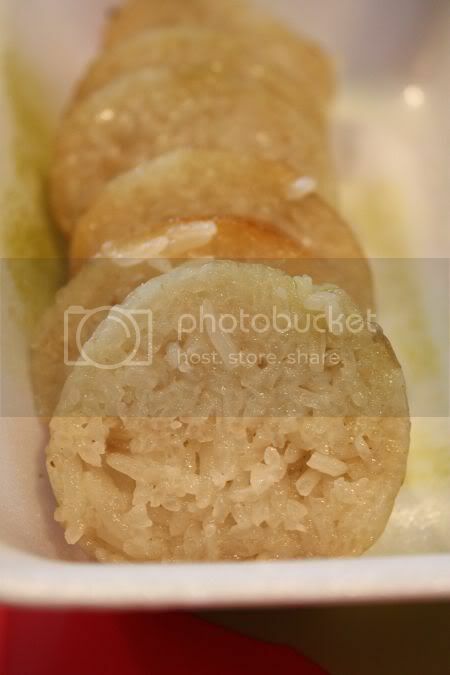 Usually glutinous rice is cooked with coconut milk and kept white, this version uses gula melaka syrup to cook the rice. Each grain is enriched with the taste of gula melaka, making every morsel, a delight to savour. You top it with loads of freshly grated coconut to get a satisfying kick start to the morning. 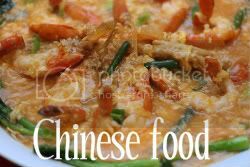 Another unusual dish here is apong that resembles American pancakes, but studded with slightly coarse black pepper granules. 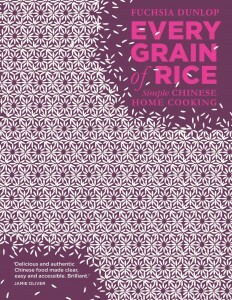 You either eat it with grated coconut or curry. No pictures of this, but it is light and delicious. While the impression I had it is better to eat here early to catch the best, there does not seem to be that many customers here. Weird, as it seems business is quite slow compared to the Johor Briyani restaurant at the back of it. For me at least, this is the nearest place to get my Kelantanese fix especially that wonderful pulut pagi. I reckon, everyone's heard a comment or two about this place, since they have opened so many outlets in every major mall in town, so there should be no surprises here. I'm currently clearing my backlog of pictures - things I ate long long ago with friends, that I never got around to blogging about. I reckon, I better clear these before I entirely forget about the taste of the stuff. For those die-hard babyback ribs fans, Tony Roma's here is a major dissapointment, as they have decided to not serve any pork. While their major best-selling item is off limits here, the restaurant is doing quite well, and I have read some believe it is better than Chillis. Personally, I don't think so as most dishes I have tried in Chillis have been good while Tony Roma's seem to score lower in the taste category with their items. One weekend, we had decided to dine with friends - it was a good choice especially since portions were so huge, that we could share among the 5 of us. 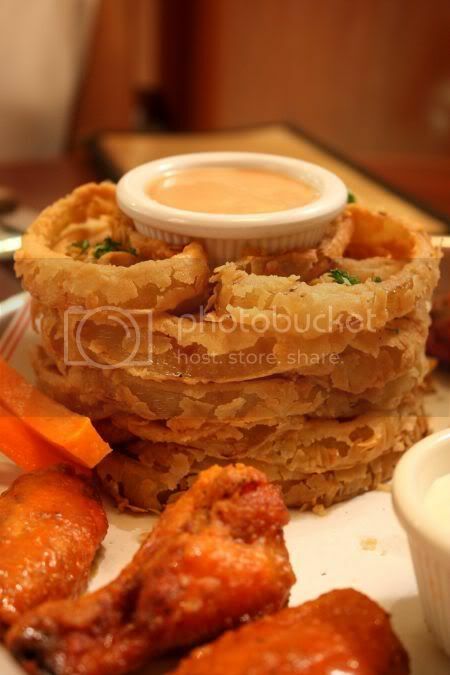 An appetizer platter was ordered - fried onion loaf, buffalo wings and potato skins. 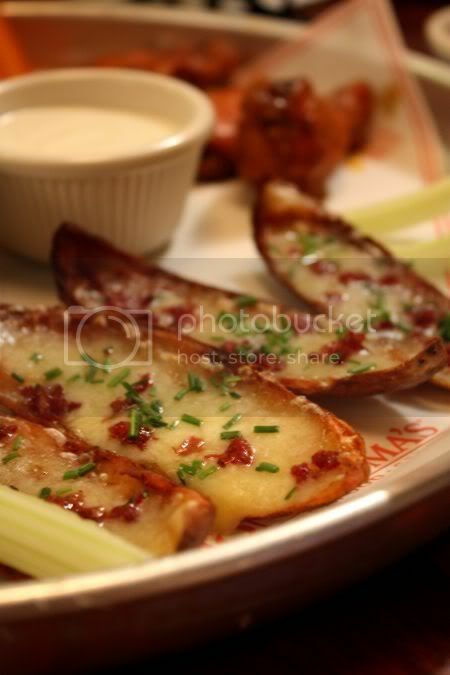 While the potato skins is quite sparse in terms of toppings, it was pretty good stuff. 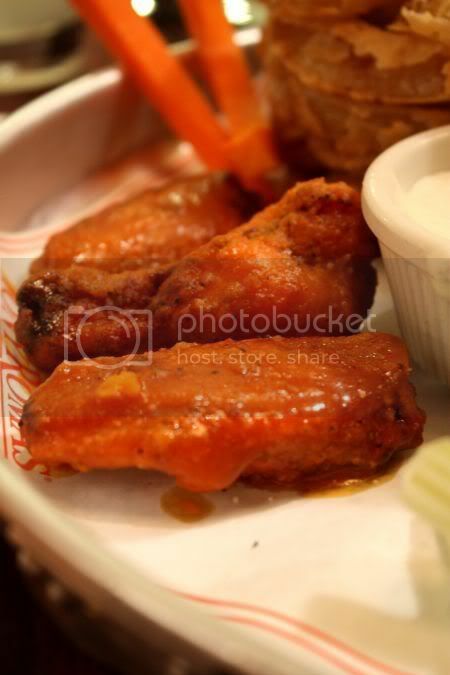 I didn't quite like the buffalo wings though, hence I drenched them with blue cheese sauce to get rid of that icky taste it had. 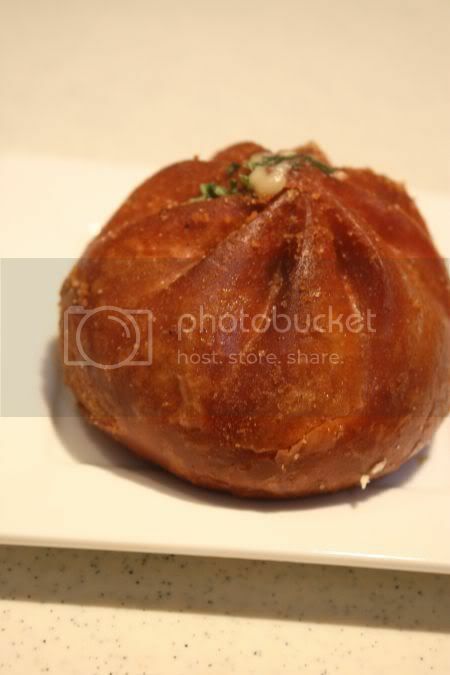 Fried onion loaf was not bad, nice and crispy. 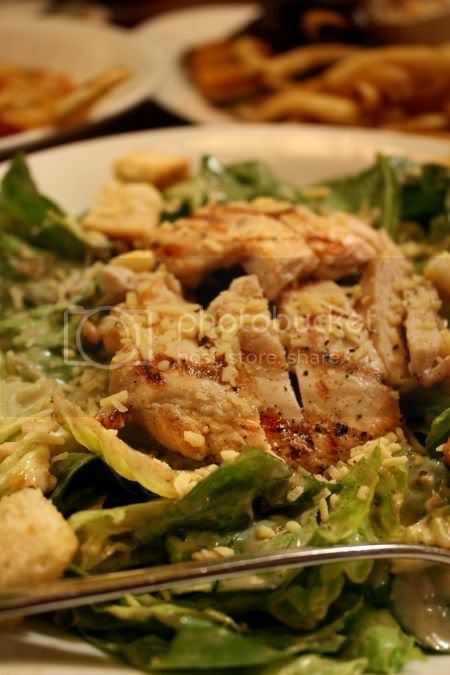 Since Jess was on a diet, we added greens to our order - a Caesar salad laden with grilled chicken pieces. I thought the salad dressing was a bit too much - very creamy and overpowering. We also had one gripe about the salad - they mixed romaine lettuce with other types of lettuce!!! Aiks, everyone knows Caesar salad is all about romaine lettuce and no other imposter lettuce will do! 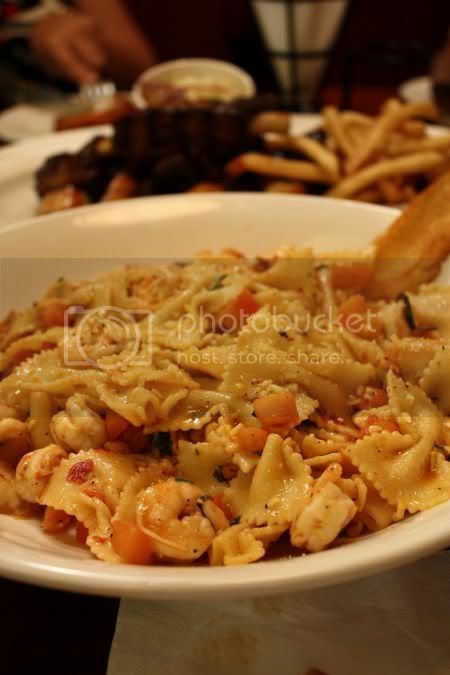 The pasta with its huge bowtie pasta, mixed with chopped tomatoes and shrimp, was frankly quite mediocre tasting, definitely not something I would re-order, if I dined here again. 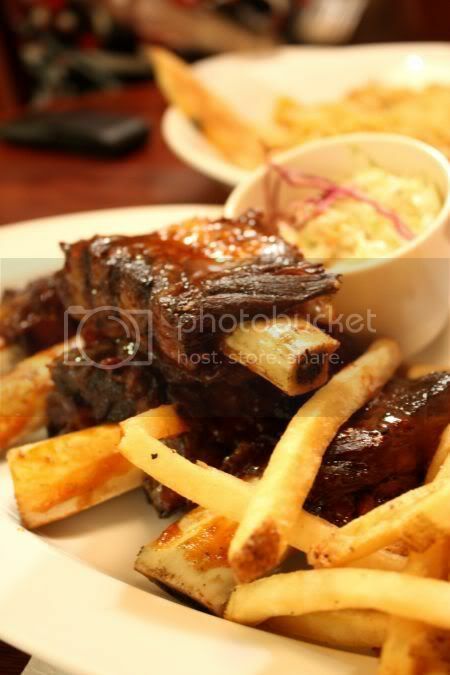 While all our other orders were mediocre or nothing fantastic, Tony Roma's redeemed itself with their a platter of bountiful beef ribs, which we shared - each one had a rib! Simply sublime - smoky with fork-tender meat, that I could eat these all day!!! Definitely made my meal here, or else I'll write off this place (I was kinda dissapointed the first time I ate here also but the beef ribs saved their rep too). Since there was so many stomachs helping out to finish the food, we managed to squeeze in some dessert - a chocolate Avalanche. While the dessert looked rich and inviting, it was sadly lacking any chocolate taste. 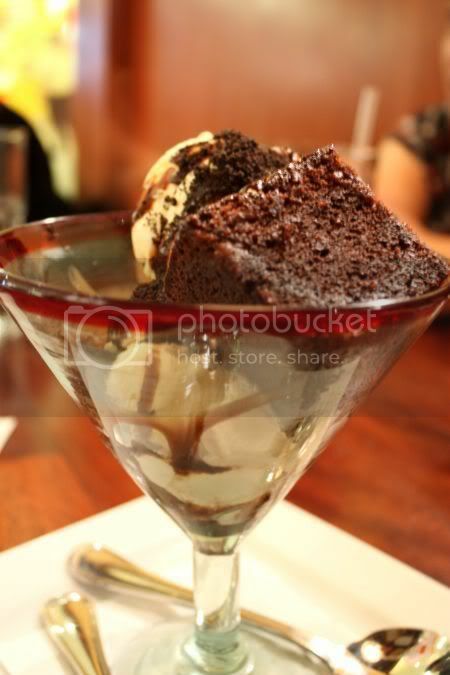 Give me chocolate brownie with ice cream at Chillis, anytime instead. While there were quite a number of misses here, one hit that I won't mind returning for again and again, are those melt in the mouth beef ribs! Prepare to be pau-ed out, with this post. Last week, I was at Pavilion doing a quick spot of shopping. Seems like ages since I stepped into the place as there was so many new dining places. What did I spy with my little eye? Let's see - I saw an Italian restaurant on the 6th floor serving non-halal food (hmmm, what is it with these porky places that crop up everywhere? ), Bosphorous the Turkish place has expanded their outlet to outside (looks like they were serving cakes and I think I spied a Turkish wooden ice cream tubs), Etoile has dissapeared from the level where they hold all those shows and events and been replaced with Coffee Bean & Tea Leaf and I think I spotted Dome from a far away. There are also a couple of new places on the Food Court level, including this Mr. Baoz, right next to Bengawan. Read about its existence from KampungboyCitygal, hence I decided, it will make a nice take-away dinner. Seems they are super popular in Taiwan - as they proclaimed they have sold millions of baoz in Taiwan! 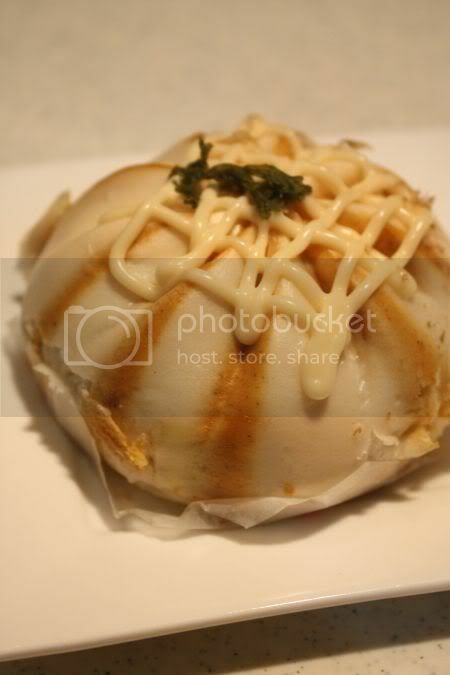 The steamed buns come in boxes of 3, 6 or 12 pieces. 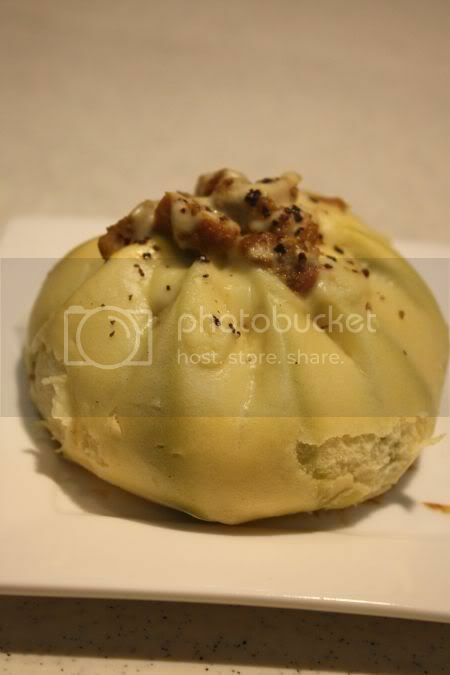 I choose the 6 piece box - the Diamond one, which had a mix of savoury and sweet steamed buns. When I got home, I was too hungry to heat them up, so I ate them lukewarm with Splashie Boy. Some bits were stuck to the box, hence the slightly "deformed" look of the buns after a quick session of picture-taking. I guess I kinda anticipated more, but after tasting each bun, Splashie Boy and I reckoned they were just average. In fact, after a while, it took me some time to try and distinguish each different flavour. Not a very good indication of how it is, only the squid roll stood out for me (as it had these pesky bonito flakes that fell on my black top, after I bit into it) and the deep-fried curry chicken bao as it was salty and crispy. One thing that amazed me was the cats was paying tremendous attention to the buns, something they don't usually do with food. I reckon it was the smelly bonito flakes calling their name. Kits even decided to sniff one out but don't worry, he didn't get to eat it, or else I envision I will have to drive him to that super expensive animal hospital on Jalan Tun Razak for immediate treatment. 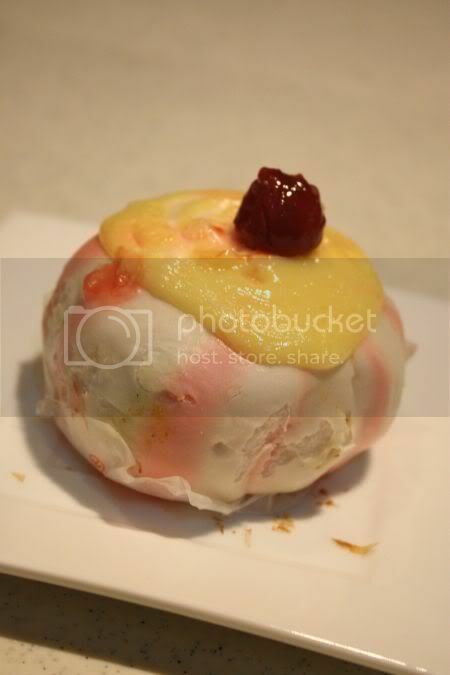 I thought the sweet ones were not too bad with generous fillings. 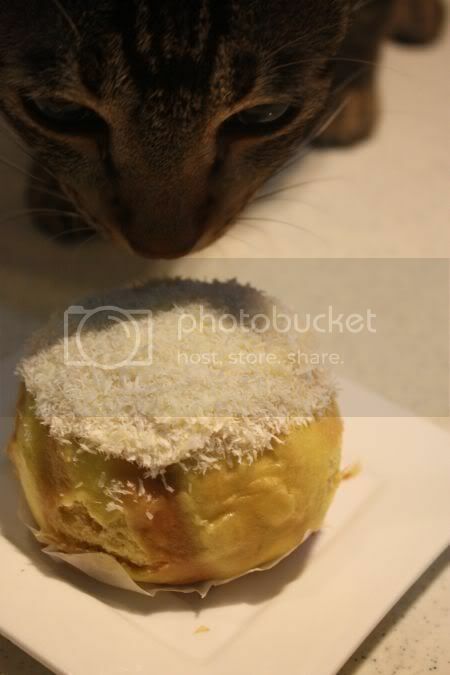 I quite liked the one that Kits sniffed out - the Snowflake Sesame Baoz with the dessicated coconut fillings. Guess it would taste even better if I had stopped to reheat them. To be honest, these steamed buns just didn't impress me much. Give me an old-fashioned char siu bao or even a lotus paste filled pau instead, as these new fangled buns just don't seem to rock my tastebuds at all. Pork free. Outlet is next to Bangsawan and Food Republic. For further details, check their website, http://www.mrbaoz.com.my/ out. Kinda confusing with the local Baoz. While I like travelling, one thing I absolutely hate is the time wasted on flights. Especially flights to the USA, where it seems to take forever and ever before I reach my destination. This time round, I did manage to catch loads of movies on the flight though - made up for my lack of movie watching, since I have been busy with work. Another must-have to combat the dismal flight menus is to try and search for hot food to warm my tummy especially after a long flight. Usually it is a hot bowl of udon or ramen at Narita Airport, but this round I decided to be very adventurous and venture out to the streets of Singapore, very early in the morning. A bit crazy, I know but weirdly enough, I felt kinda safe even though I was right smack in the centre of sin i.e. 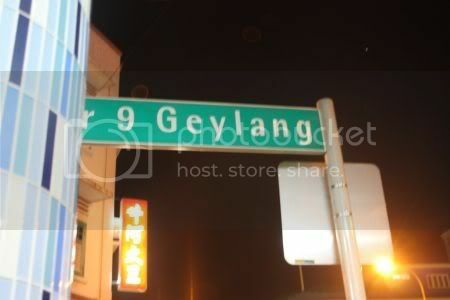 the red light district of Geylang. Food came quickly once I ordered since not many people were around. Portions are not big (quite tiny compared to KL) but tastewise, not bad especially since I was starving. 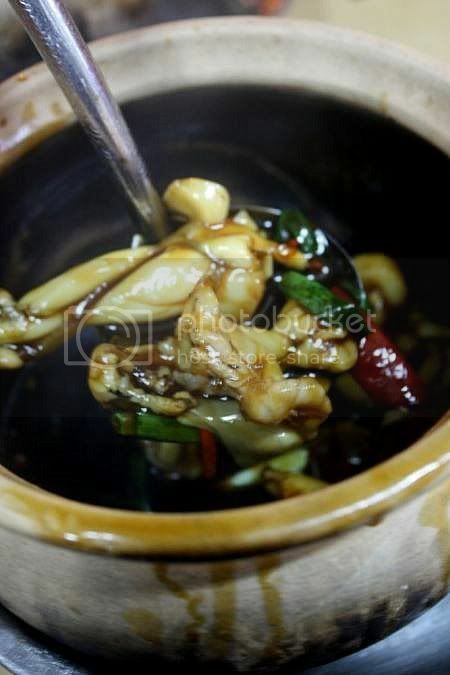 The kungpo sauce was pleasantly fiery, while the frog legs were tender. I liked the thick and smooth porridge served with it and scraped my claypot clean from all its thick brown sauce. Not sure why, but porridge in Singapore always taste better than KL porridge. After my meal, I did a little walkabout around the area, making sure I avoided the even number roads as that is where the brothels were located (from what I heard!). Saw lots of eating places around the lanes that looked like economy rice places with trays and trays of food laid out to be selected. I wanted to wander more, but decided not to push my luck, so I hailed a cab to get back to the airport, feeling very satisfied from my early brekkie. I'm back! Had a good break even though it was a super hectic schedule. Been suffering from minor jetlag....hence, no blogging yet until this week. Plus, I haven't been doing anything exciting to blog about too. 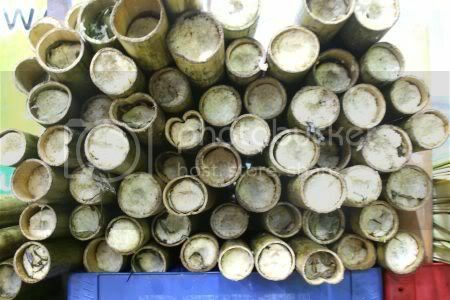 Keeping with the Raya theme, I thought I'll blog about lemang we had yesterday. Did a quick trip down to Lembah Keramat (not Keramat okay, as I got scolded by Splashie Boy for this wrong statement, since it meant him making a few wrong turns!) on Saturday night after work and managed to get the famous lemang. so yummy and delish...one is never enough! 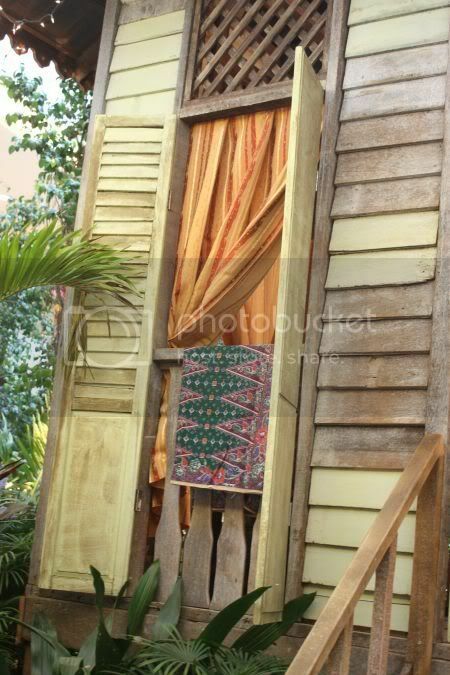 Popularly known as Lemang Pak Ali, even though the card says Lemang Warisan, there is a cute signboard at the house they operate at, proclaiming them to be the "Lord of the Lemang". 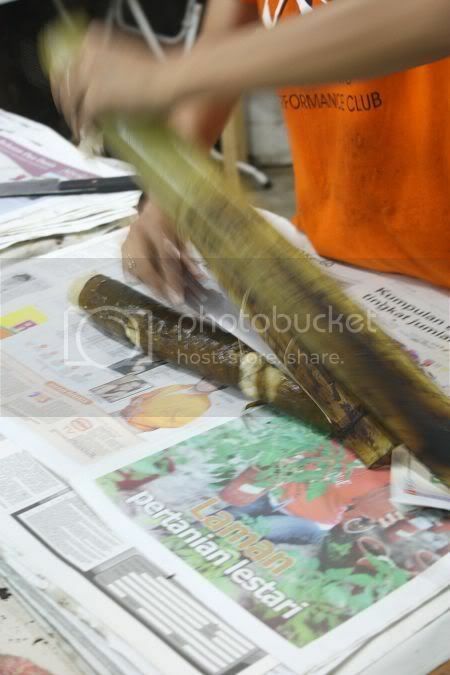 What makes their lemang special, according to an article I read before, is they use wild banana leaves to wrap the lemang. Usually, you can get kinda dissapointed with lemang - bits of uncooked rice and hard bits within, but this lemang was perfect. Soft and aromatic, everyone couldn't stop eating it for lunch yesterday. To accompany the lemang, we had bought a portion of almost black colour rendang tok. 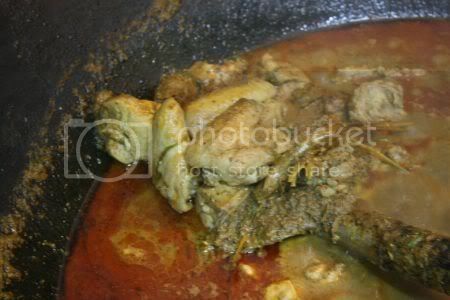 Sadly to say, the pictures of it didn't turn out well but the rendang tok was super yummy. A bit spicy from all the pepper used but very tender and delicious, that one still continues to eat even though it burns your tongue. There's also gulai ayam (as seen above cooking in a large kawah aka the wok), serunding, home made cookies and ketupat daun palas at the place. My sister had also brought back cake from Singapore - the infamous chocolate fudge cake from Lana Cakes. Seems this place is super popular and it is extremely difficult to get this lady to place an order. 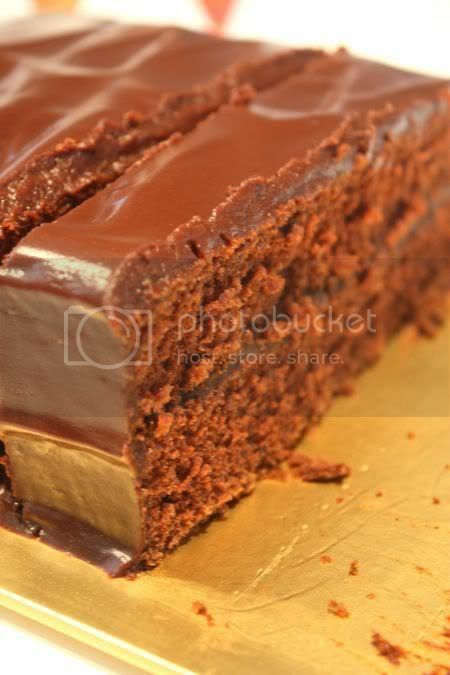 This cake reminds me of old-fashioned chocolate cakes - a very light and moist sponge topped with soft chocolate cream. While, the taste of chocolate is not very evident here, the cake is extremely light and comforting, that you can't help eating it until the last crumb is finished. Hope the celebrations are going well..... Am sure everyone is enjoying the 2 day break and also the chance to eat loadsa lemang and rendang. Lucky people! 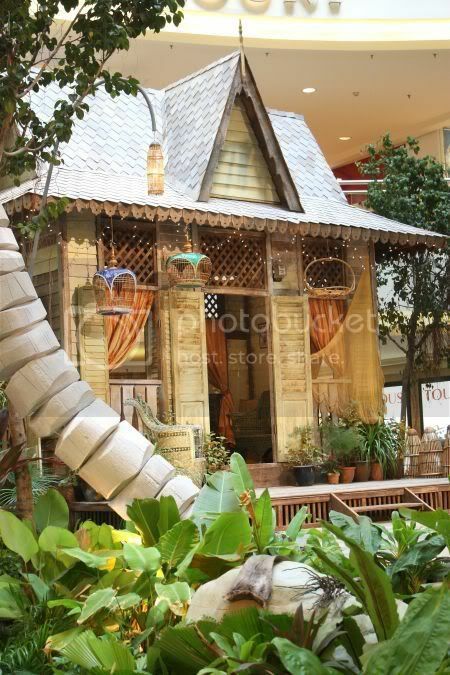 No yearly ritual of snapping pixs of the lemang sellers at Damansara, but this year, it is an amazing scene I saw in the mall - a village scene that looks just like the real deal. We are still on the road, left a small town for another smaller town. Since we got in very late, yet to see much but we did check out the local diner - a 24 hours joint with pies (that look amazing! ), greasy food like chicken fried steak, American memorabilia like old signboards and truckers. Really lives up to my expectations of diners from the movies we watch all the time.